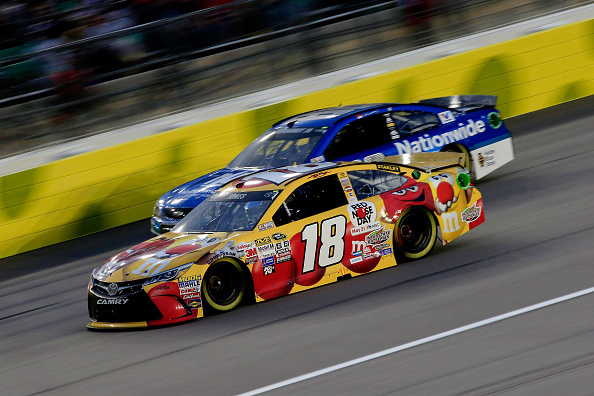 Martin Truex Jr. leads the field during the NASCAR Sprint Cup Series SpongeBob SquarePants 400 at Kansas Speedway on May 9, 2015 in Kansas City, Kansas. Prior to Saturday night, it had been 66 races since Martin Truex Jr. had been to victory lane, his last win coming at Sonoma in 2013. 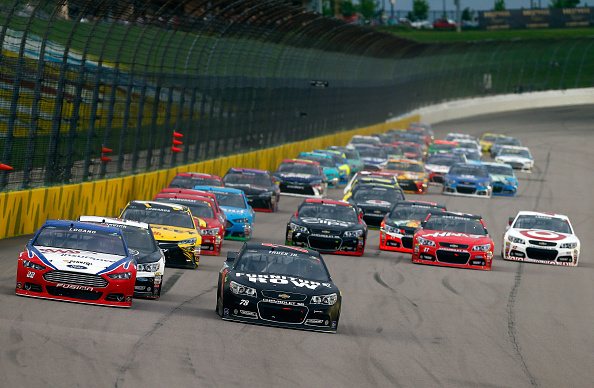 He almost ended that drought at Kansas Speedway Saturday. Truex is having a good year and entered Kansas with nine top ten finishes in the first 10 races. Truex raced his way to the lead on lap 58. By lap 73, Truex had a lead of 2.63 over Kevin Harvick as green flag stops loomed. Truex was back in the lead after the stops cycled through just over 4 seconds over Harvick. By lap 91 Truex enjoyed a 6.5 second lead. On lap 92 Truex was lapping Dale Earnhardt Jr. who was in 16th. The rains came and Truex’s momentum was stopped for two hours and sixteen minutes. During the break, the talk was focused on Truex and what it would take to catch him.